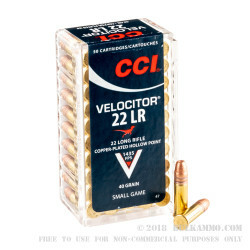 One of the best rounds you can buy for general rimfire .22 LR use from a name you can trust - CCI. 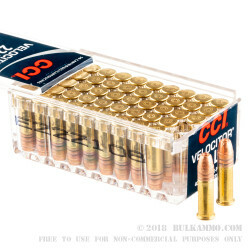 The first thing you’ll notice is that the CCI Velocitor is fast and accurate ammunition. It moves out of the muzzle at 1435 feet per second and it is capable of shooting sub minute of angle easily. You’ll also notice that it is well made and consistent. It simply doesn’t have failures to fire or stove piping, or failures to extract. It’s very good across the board unless you’re using a firearm that has a lot of bad springs or parts that have fouling or oxidation on them. 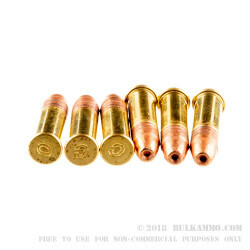 One of the more important things that you will notice, is how clean this ammunition is. It fouls your gun very little. The unburnt powder is significantly less than competitors. The metal shavings and lead residue left by other rounds is nearly non-existent after shooting the CCI Velocitor. As a final note, this is a round that can legitimately move out to 300 yards or more for most target needs. Try saying that about your regular .22 LR ammunition. As a hunting round for small game or as a target round for discerning shooters, yes it’s slightly more money, but it is money well spent. Just fired 100 rounds of this through my brand new Remington 552. The rifle was dead-on straight out of the box and the ammo performed magnificently. No FTE or FTF - only 100% performance. But then again, for this price, and the price I paid for the 552, I expect significant performance. Q: How many feet per second verses the stinger round?? A: Hello Michael! 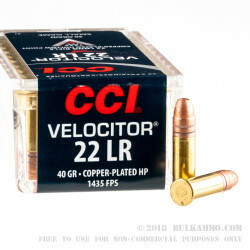 CCI lists the muzzle velocity of the Velocitor at 1435 fps. Q: What is the velocity of these rounds out of a rifle and/or pistol length barrel? A: CCI Velocitors have a muzzle velocity of 1435fps from a rifle and 1120fps from a pistol, depending on barrel length.